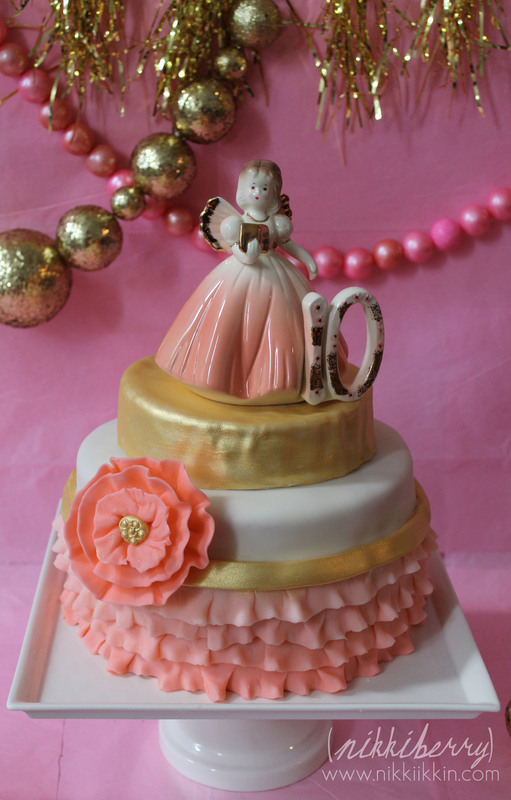 This precious pink and gold cake was for my daughter Macy on her 10th birthday. No matter when her birthday party takes place I always make another cake for us to celebrate together on her real birth day. I had an itching to create a little more for this cake because I wanted to experiment with some backdrop ideas. First off, the cake had a special importance to me. The porcelain birthday doll on top was the same doll that my mom put on top of my 10th birthday cake. 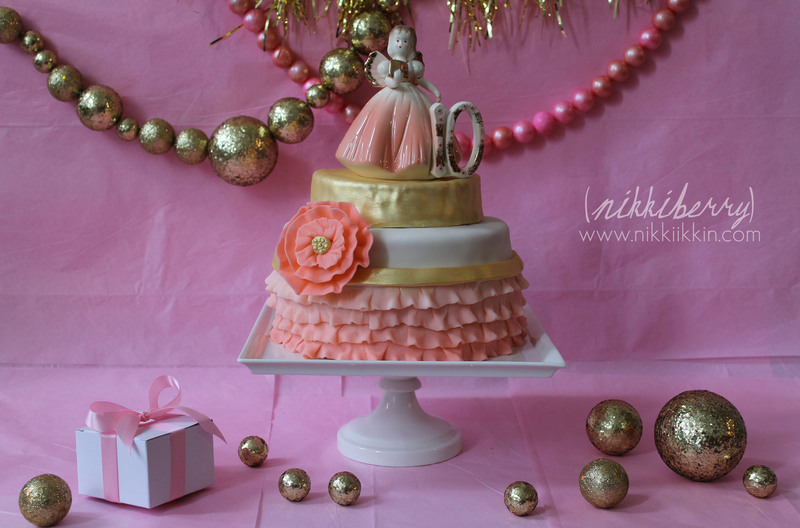 Inspired by the pink and gold, I then designed the cake around that doll. 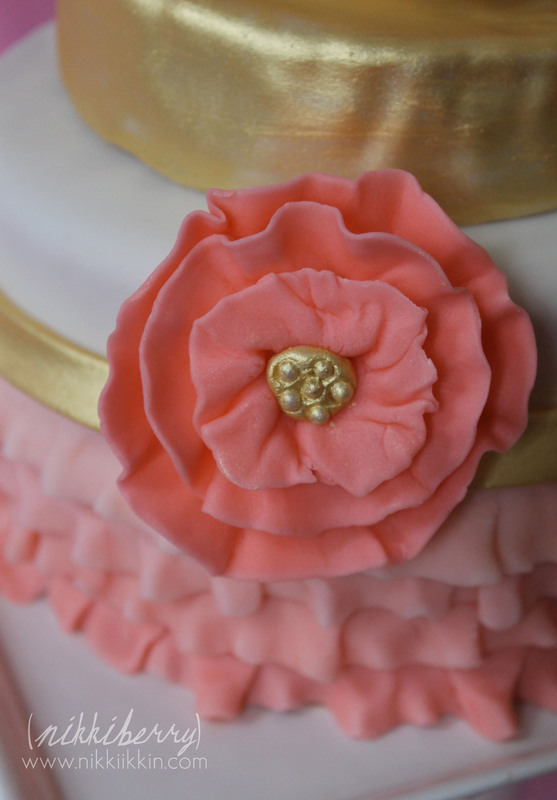 If you’re wondering why it has two different looks, it’s because as I was assembling the cake I thought that it was also pretty as a single ruffled tier without the extra flower and tier so I took some picture of it like that. I try to experiment with each opportunity I get to make a cake. 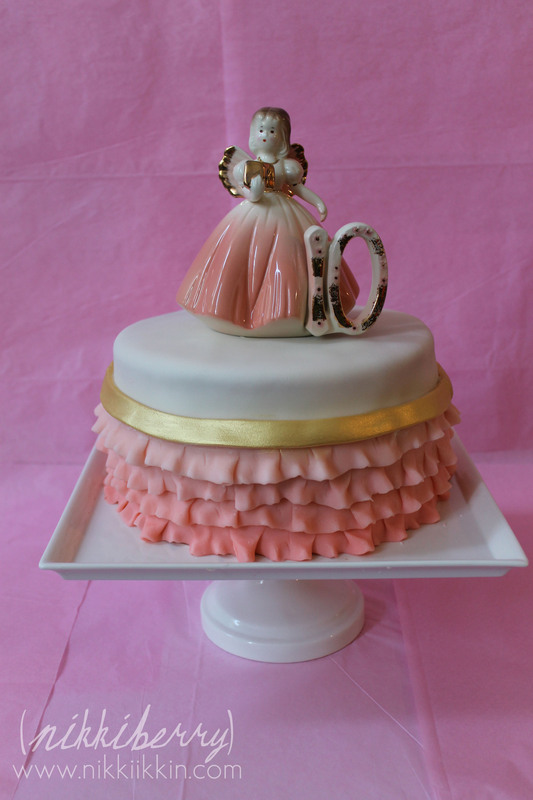 This was my first ruffled cake, I thought the process was easy enough. 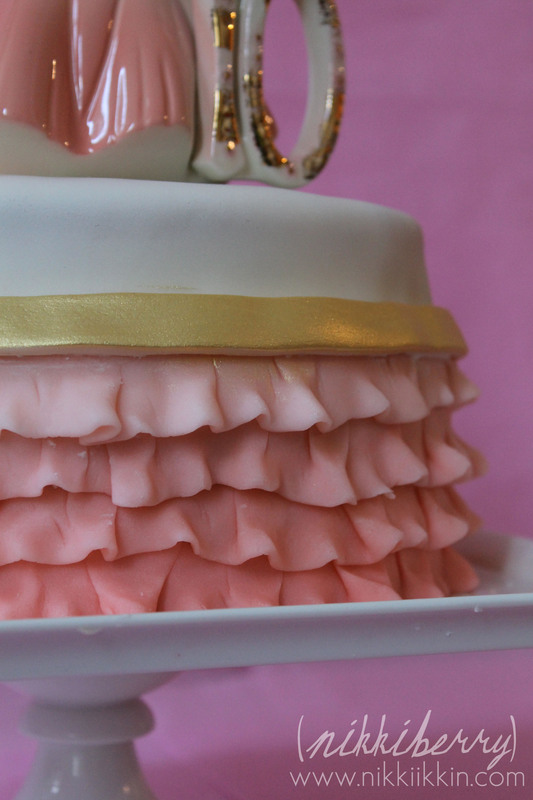 My technique was a mixture of pinching and folding and I made each band of ruffles in 2 sections to circle this 8″ cake. I am just beginning my love affair with gold luster dust. I want to use it on everything ever since I made these Tea Party Toppers. I probably would have used it even if it wasn’t an accent on the porcelain doll. This fondant flower is styled like a fabric brooch and has been popular in my Etsy Shop, I make it in several sizes and any color to be used on cupcakes or a cake. For the grande finale I put it all together with a few homemade garlands and tissue paper backdrop. 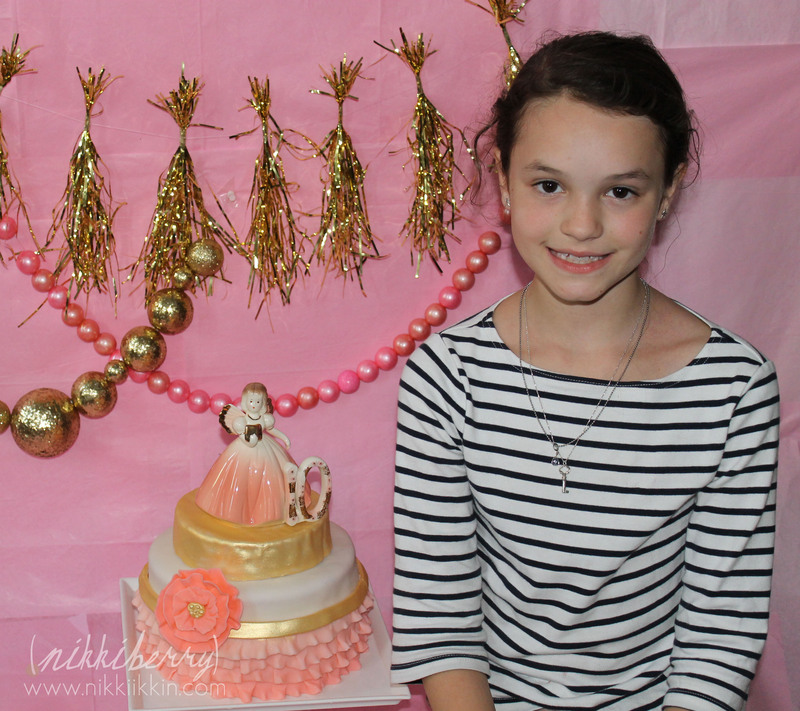 I wanted to make a backdrop with minimal effort and cost but still eye catching. I popped into a Party City and spent less than $20 for this backdrop and assembling it took about an hour because I created all of it from scratch. The wall and tabletop are covered in plain old gift tissue paper, layered for color depth and for an imperfect look. 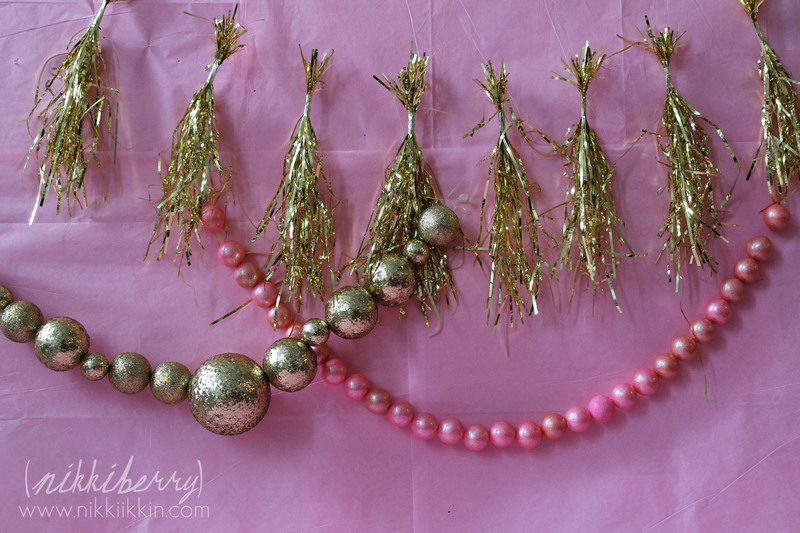 Macy and I assembled the pom-pom garland using a bag of metallic gift shred. I know it sounds crazy to think about creating each pom with single strands but I knew that I needed less than 10 poms and a small bag of shred was only $3. It took about 30 minutes to gather and tape the top of all the poms. Then I threaded fishing line through the tape with a needle. 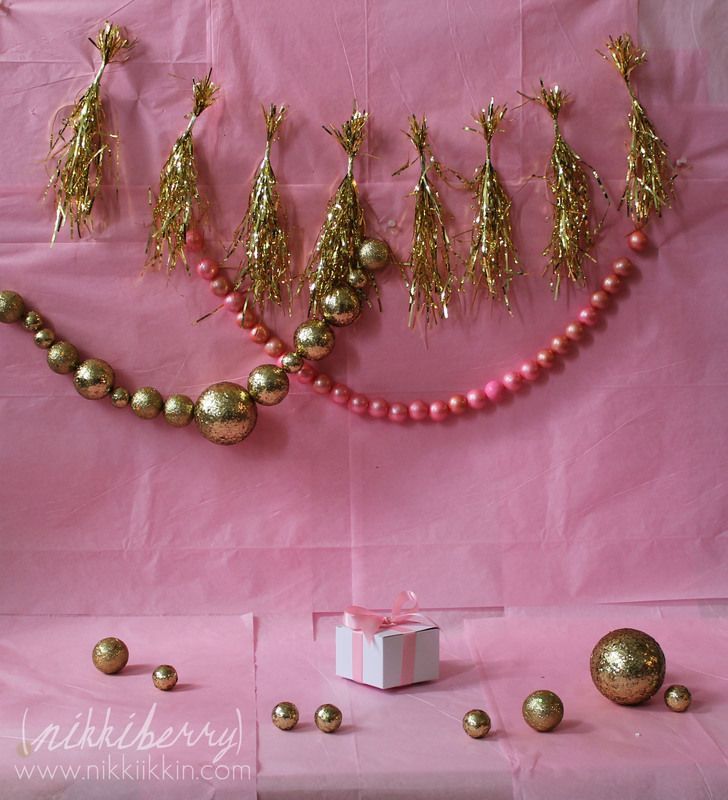 The glitter ball garland started as a prepackaged set of glittered sphere decorations in the wedding section at Party City. I thought it was a good price at $8 but I could have also purchased a solar system styrofoam ball set and rolled them in glue and glitter to make my own. I threaded them with fishing line and a needle too. The last garland is gumballs. Ive been experimenting with gumball necklaces lately and although I like the idea and the look of gumball strands, they are a bit of a pain to work with. I’ve found that the quickest and most efficient way to make the hole is to drill it, but even then its messy and still takes a great effort. After all the garlands were done I simply used tacks pushed in the drywall to hang. Getting a balance in swag shape was the hardest part. The gumball garland is pretty heavy too and fell a few times. Whenever I use them again I will use temporary hooks from 3M. There she is Miss Macy Berry, 10 years old!